Share Christabel and the Jons's EPK! verge: how did it all begin for you? CD: I've been playing the piano since about seven, sang in my church and school choirs. Around fourteen, I taught myself guitar using a Beatles songbook. It wasn't until I was sixteen or so that I began playing open mics. Then I stopped; basically I became a hermit. I wrote songs and just played them in my living room. About three years ago, I decided it was time to start playing out, to share my music with people. CD: Jon Whitlock, the original Jon, was my first drummer and changed my writing style and musical direction. I was just performing solo, girl-with-guitar folk songs. He swayed me to write more jazzy pieces. We added an upright bass, and decided we needed a fourth member. We found this guy who played violin and trumpet. We were like, "It's folky and jazzy, it's perfect." We started playing around our hometown, Knoxville, working up a strong following, and then started branching out. We tend to tour all the states bordering Tennessee, though there is an occasional wild hare. verge: what process do you go through when writing your songs? CD: It usually starts with a line of poetry I get in my head. A lot of the times, I'll be listening to the radio while driving home, which reminds me of something. Then in my head will be a line of poetry to a melody, and I'll write it on the back of a stray receipt, go home, pick up my guitar and figure out the chords. The rest of it falls into place. verge: so would you consider yourself a poet? CD: I guess so. I rarely publish my poetry, but I definitely write it and keep a blog on myspace. I write haikus and little poems when I'm traveling around or chilling at home. I'm more of a songwriter; most of my poems turn into songs. CD: That's kind of tough. It's a mix of different genres. Definitely the great female jazz singers. 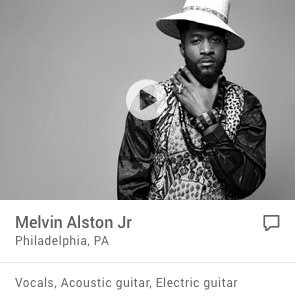 But I also listen to Willie Nelson, Ray Charles, that kind of thing. Really, it's the songwriting that is almost more important than the voice. You can have kind of a rough sound, but if the lyrics get to you the right way? That makes up for it. verge: what are some of your most memorable experiences, performance-wise? CD: Bonnaroo 2007 was great. We got to go for free, were treated like real artists, camped out with famous people. It was amazing. Then there was the time we opened for the Brazilian Girls in Knoxville. That was in front of thousands of people, it was scary and weird but our first huge show. verge: do you prefer the more intimate settings? CD: Definitely. It's easier to connect with the audience and gauge their response. verge: what do you see yourself doing in the next year? CD: We've got a slew of new songs. It was a rollercoaster of a winter, which is good for writing. Dramatic things make for good songs. Hopefully we'll get into the studio this spring, have a new album out in early summer of '08. Play festivals, build audiences. I'd love to have a base strong enough to expand and play New York and Boston. CD: We're just a really fun, goofy foursome traveling around in a crappy van stopping in tons of thrift stores. We're always looking for good breakfast restaurant recommendations. Wherever we can get the best eggs and bacon the morning after the show. Christabel and the Jons, a well-stirred blend of southern blues, swing, and folk, play Stillwater Taproom, April 11th at 10pm. Christabel & the Jons will be performing a live show and hosting their CD release party this Tuesday at noon, at WDVX’s Blue Plate Special. Love & Circumstances, their much anticipated studio release, recorded at Ottofish Studios in Johnson City, is pure joy from start to finish. I’ve been intrigued with Christabel & the Jons since I first saw them at Downtown Grill & Brewery in January of this year. They were a trio back then with Christa DeCicco (“Christabel”) on vocals and guitar, Jon Whitlock on drums, percussion and back up vocals, and Jon Steele on upright bass (hence “the Jons”). ...One of the reasons I keep returning to their shows is because of Ms. DeCicco’s captivating voice. The modulation of her pristine vocals and her phrasing fascinate. Even her humming is enchanting. A natural born performer, her gracious stage presence is also a draw. The band’s vintage wardrobe also contributes to the atmosphere of their “speak-easy,” jazzy folk-infused music. … If you don’t know what to do with your company on the day after Thanksgiving, please take your guests to Barley’s to experience the magic of Christabel & the Jons. Even without the effects of beer, you will fall in love with their music, and Grandma might even find herself singing along to “Old Fashioned Morphine.” Thankfully, as of this Tuesday, we will finally be able to own a piece of this magic. When Christa DeCicco first waltzed onto the local scene not quite two years ago, accompanied only by her molasses voice and honey-colored dreadlocks, we figured it was just a matter of time. At some point, her song-craft would start sticking to the ears of the oblivious open-mic crowds to which she was playing. 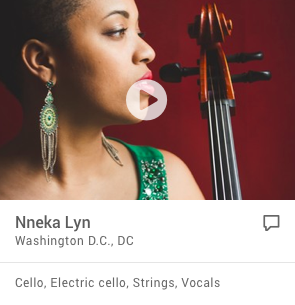 At some point, her talent would attract an equally gifted ensemble of backup musicians to support it. Eventually, she’d probably even cut her hair. What we didn’t realize was the ease with which she would be able to accomplish all this, and more. Not only was she able to gather around her an all-star cast—Jon Whitlock on percussion, Mischa Goldman on upright bass, and Seth Hopper on trumpet and violin—under the moniker of Christabel and the Jons, her own voice, has come into full bloom. If it sounds enticing, it is. Pick up a copy of Love & Circumstances for yourself at Christabel and the Jons’ show this Friday, Nov. 24, at Barley’s, 9 p.m. The band’s even cuter in person, and DeCicco’s new bob is impeccable. A year ago, Christa DeCicco was finding her voice at open-mic nights at downtown Knoxville's Preservation Pub, nervous and timid before a crowd of disaffected drinkers who offer polite applause and quickly forget about the budding singers who clamor for their attention. DeCicco had something, however, that demanded a second listen. Quickly, the girl with a voice like warm honey began to get noticed, and within a few months, she went from volunteering her services at the Pub's open-mic night to getting paid to play there. One of our favorite folkies is heading out to see the country and spread her music far and wide. Bluesy songstress Christa DeCicco played her final local gig until October at Preservation Pub on Aug. 24 before driving solo towards the West Coast. Her aim? To promote her music, make some industry contacts, see her friends and do some manual labor as part of the Willing Workers on Organic Farms volunteer program. Her destinations are California, followed by Oregon, Washington and Vancouver, B.C. Keep up with her progress at www.myspace.com/christadecicco. By day, DeCicco is a self-employed landscape artist and gardner, a girl with red clay under her fingernails and potting soil stains on the knees of her jeans. At night, she becomes Christabel, hostess of the party thrown by Christabel and the Jons at whatever venue the "sultry Southern swing" band happens to perform. .For those who have watch DeCicco's career, however, perhaps it's not so surprising. After all, this is a girl who's changed dramatically since her early days of performing as a dreadlocked singer-songwriter, getting up at area open-mic nights and timidly performing her songs before tough crowds at places like Market Square's Preservation Pub, people who were more interested in drinking beer than paying attention. DeCicco had something, however, that demanded a second listen. Quickly, the girl with a voice like warm honey began to get noticed, and within a few months, she went from volunteering her services at the Pub's open-mic night to getting paid to play there. Before long, DeCicco — a graduate of both Farragut High School and the University of Tennessee who's lived in Knoxville since she was 5 — had cut her dreads and embraced her love of vintage dress and music. … instrumental minimalism suits DiCicco’s voice, a bluesy purr better suited to a 1920s phonograph than modern microphones. In accordance, the lyrics she drapes her vocals over are suitably nostalgic—whether a memory of watching fireworks over the Tennessee River or a cover of Jolie Holland’s “Old-Fashioned Morphine” or Paul Simon’s “50 Ways to Leave Your Lover.” Steele and Whitlock amble along in time on their respective instruments, typically outfitted in three-piece suits that complement DeCicco’s own vintage gloves and gowns. Christabel and the Jons are Knoxville's torchiest acoustic swingers. Lead singer Christa DeCicco has the kind of confident, rich voice you can quickly fall in love with, and the instru-mentalists are no less talented. Staking out a musical claim that borrows from both jazz and country influences, DeCicco and the musicians shift easily between the two. While the entire disc is a pleasure, a couple of numbers are pure knockouts. DeCicco's easygoing vocals, combined with Seth Hopper's inspired violin work and a driving rhythm provided by drummer Jon Whitlock and bassist Mischa Goldman, help turn the already catchy melody on the song "Remember" into a number that can make you feel like one of those poor monkeys in drug trial - but instead of hitting a button for another shot of cocaine, you're-punching the repeat button on the CD player. Valerie Sanders' on-target clarinet and flute break combined with Hopper's subtle bandoneon accompaniment creates just the perfect foil for DeCicco's soulful vocals on the song "Eye for an Eye." It's a delicate stunner. And, while you might have thought you never needed to own yet another version of "St. James Infirmary," DeCicco's performance with local swing band The Streamliners is proof there's room for just one more version of the song in the world. At times, the band falls into the retro-1930s jazz style that many groups have been experimenting with over the past couple of decades, but Christabel and the Jons pull it off well. "Love & Cicumstances" is high on style, low on schmaltz and is an excellent disc. 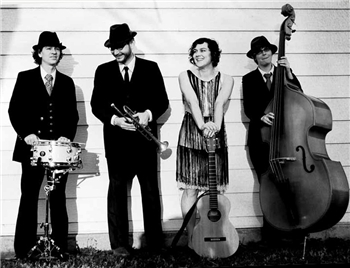 Christabel and the Jons is a sultry southern swing quartet based in east Tennessee. Their music is acoustic and colorful, a blend of vintage swing and Appalachian folk. The group saunters and sways together with ease. Lead singer Christa DeCicco steals hearts with her come-hither delivery and charismatic stage performance. Old suitcases and dressy vintage costumes from the 1920s-1950s give the performance a torch singer, speakeasy feel. 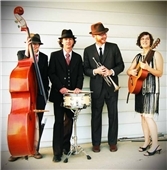 Since the spring of 2005 this quirky foursome has been performing and recording their distinctive style of folky swing. In November of 2006 they released their first official album, "Love and Circumstances." Christabel and the Jons is currently weeks away from recording their highly anticipated second album, which is as of yet untitled... Meanwhile they continue to tour, mostly around the southeast region but with periodic voyages to the northeast, southwest, and pacific northwest. They can often be found in thrift stores as they travel from town to town, hunting for clip-on ties and 1950s party dresses. Christabel and the Jons plays both originals and covers. Our typical set length is anywhere from 45 min to an 1 hr 30 min.